Lisa Fenn produced human-interest features for ESPN for over a decade, but one particular story came into her life and never left. After seeing a newspaper image of two young wrestlers from one of Cleveland's tougher public high schools, Lisa followed a hunch and flew back to her hometown to meet the boys that very day. What she found caused her spirit both to sink and to soar. As Lisa filmed her feature about this remarkable friendship for ESPN, she grew to understand the suffering Leroy and Dartanyon had endured, and she fought for their trust and their confidence. The three formed a surprising and meaningful connection--and once the television story ended, Lisa realized she couldn't just walk away. Though Leroy's and Dartanyon's futures were limited by abject poverty, Lisa resolved to give them the chance she knew they deserved. She worked tirelessly to see them through school and athletic pursuits, broken hearts, phantom limbs, and the bewildering obstacles that, at every turn, tested their individual strengths even while strengthening the bonds between them. 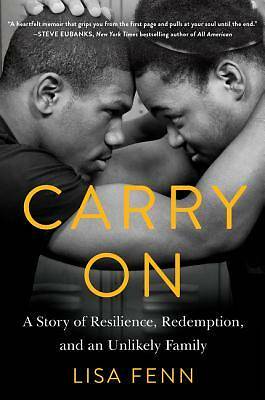 More than a story of two underdogs overcoming innumerable hardships, Carry On is a touching tale of an unlikely family forged through barriers of race, class, and disability. It is a powerful memoir about grit, love, hope, and faith--and the courage to carry on, even in the most extraordinary circumstances.